1 . This place is a staple to Ryerson life. 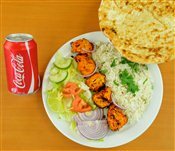 Opened late into the night Mehran is a must after a late night study session when you skipped dinner and running on nothing but coffee lol your body and taste buds will thank you.